Also serving communities of Dunnellon. There are 13 Assisted Living Facilities in the Hernando area, with 1 in Hernando and 12 nearby. To help you with your search, browse the 68 reviews below for assisted living facilities in Hernando. On average, consumers rate assisted living in Hernando 5.0 out of 5 stars. Caring.com has helped thousands of families find high-quality senior care. To speak with one of our Family Advisors about assisted living options and costs in Hernando, call (855) 863-8283. Hernando, Florida, is a census-designated city in Citrus County, Florida, located along the scenic edge of the Tsala Apopka Lake. Antique stores, museums and golf courses provide plenty of activities for seniors who live in the area. For individuals who need help with daily living tasks, 22 assisted living facilities are located within the area, including one within the city limits of Hernando. These facilities are regulated by the Bureau of Health Facility Regulation and provide services under either a standard license for routine personal care or under a specialty license with limited nursing services. The Hernando city area is home to world-class medical facilities, including the Citrus Hills Medical Center, in the event of medical emergencies or illness. Hernando has an array of community resources for seniors, including Aging Care Advocates, an organization that works to improve the quality of life of seniors in the area as well as two senior centers. Find-A-Ride Florida helps connect seniors with transportation in Hernando and the state of Florida. The program offers discount prices for seniors 60 years and older for the purpose of traveling to medical appointments, employment, education, errands and sightseeing. Crime in Hernando is ranked on a scale from one (low) to 100 (high). Violent crime within the city is ranked 42.6, which is higher than the national average of 31.1. Property crime is ranked 41.2, which is also higher than the United States average of 38.1. Seniors who live in Hernando should consider traveling with others when exploring the city or doing errands. Seniors who aren’t fans of the cold and snow may find the climate in Hernando to be to their liking. Summers are hot and humid with highs around 91 degrees Fahrenheit. Winters are short and mild with lows around 45 degrees. Seniors on a budget may find it easier to manage their funds in Hernando at a cost of living of 99, which is comparable to the nation’s average of 100. This cost of living is lower than the state’s average of 111, which may make it more affordable to live in Hernando than other cities within the state. Assisted Living costs in Hernando start around $0 per month on average, while the nationwide average cost of assisted living is $4,000 per month, according to the latest figures from Genworth’s Cost of Care Survey. It’s important to note that assisted living rates in Hernando and the surrounding suburbs can vary widely based on factors such as location, the level of care needed, apartment size and the types of amenities offered at each community. 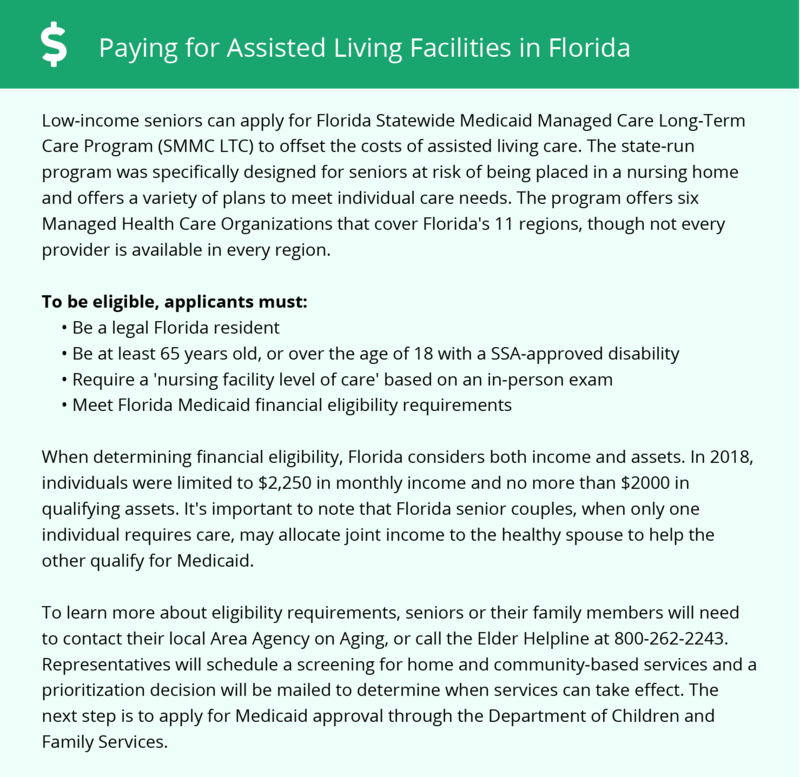 Public assistance is available for assisted living facilities in Hernando and the state of Florida through two separate programs. The Medicaid Managed Care Long-Term Care Program is for facilities that operate under a standard license and provide semi-private rooms. The Assistive Care Services plan is available for facilities that operate under a specialty license. Neither of these plans pays for private rooms, however, family supplementation is accepted. Eligibility is determined by the Florida Department of Children and Family Services. Hernando and the surrounding area are home to numerous government agencies and non-profit organizations offering help for seniors searching for or currently residing in an assisted living community. These organizations can also provide assistance in a number of other eldercare services such as geriatric care management, elder law advice, estate planning, finding home care and health and wellness programs. To see a list of free assisted living resources in Hernando, please visit our Assisted Living in Florida page. Hernando-area assisted living communities must adhere to the comprehensive set of state laws and regulations that all assisted living communities in Florida are required to follow. Visit our Assisted Living in Florida page for more information about these laws.